American Legend Aircraft Company has announced the availability of Carbon Fibre Amphibious Floats for the Legend Cub and Super Legend. Designed and manufactured by American Legend Aircraft Company, the all-new LF1500A floats allow for takeoffs and landings on both water and terra firma. The floats offer superb strength and are optimized for performance with the company's certified LSA and kit-built aircraft. The LF1500A floats are purposely built for the Legend Cub and Super Legend. American Legend Aircraft Company designed, tested and recently certified the LF1500A amphibs in-house. Features include mechanically operated retractable wheels. The rear wheels sport a trailing link design while the front wheels cantilever forward. The solution is both practical and proven to ensure reliability and safety. The LF1500A amphibs by American Legend also offer watertight storage compartments and are constructed of Kevlar and carbon fibre. 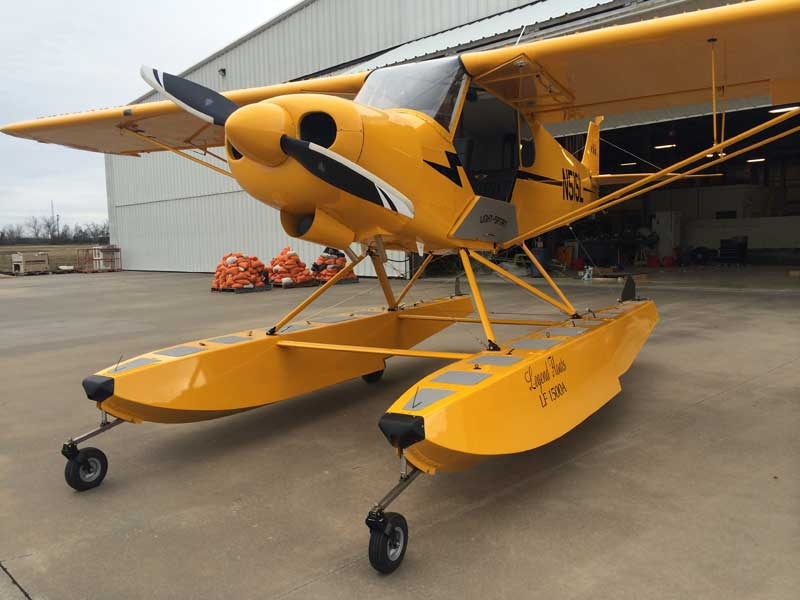 The new floats will fulfill pent-up demand for an amphibious option on the Legend Cub. For pilots, a Legend Cub equipped with Carbon Fibre Amphib Floats will feel just like the wheel-equipped Legend Cub in flight. The aerodynamic floats provide some lift, negating additional drag and weight concerns. Net weight gain on a Legend Cub with the LF1500A floats is minimal due to a 75 lb. reduction from removing the wheeled landing gear and a gross weight allowance of 110 additional lbs.. for LSA seaplanes. As useful load is maximized on lightweight Legend Cub designs, the Carbon Fibre Amphibs are available for all models, including the open-cowled AL3 and the Lycoming-equipped Super Legend. Floats on the Legend Cub have a storied pedigree. The first Legend AmphibCub was an award winning aircraft. On all-metal Bauman amphibs the Legend Cub twice won Best Take-Off at International Seaplane Fly-In (Greenville, MN) in 2009 and 2010. The original Legend FloatCub (without wheels) was awarded Best Float Fabric Seaplane Award at Sun ‘n Fun 2006. The FloatCub first flew in June 2005, only three months after the first flight of the then all-new wheeled Legend Cub. Now the Legend Cub and Super Legend are optimized for their highest performance, and maximum enjoyment, with the new carbon fibre LF1500A design. All Legend Cubs are built with doors on both sides of the aircraft. As a tandem two-seater, this is a huge convenience. While particular attention is paid in all seaplane operations to wind direction, seaplane pilots appreciate the Legend Cub’s ability to load and unload from either side of the aircraft, respective of the dock’s location. While taxiing and parking in a Legend Cub there’s no need to “walk the wire” between hulls to change sides. Equally convenient is the Legend Cub’s electric starting system which eliminates standing on a hull to hand-prop an engine.